Our friends Traci and Dan were having a garden party and they were making David Chang’s Momofuku pork which was succulent with a gorgeous crispy sugary crust served with lettuce leaves for wrapping and not one but two incredible dipping sauces. This pork is the stuff of legend. It’s the kind of special occasion dinner that spends most of the day in the oven. We had heard about it, and even had the leftovers from their party last year, but this was the first time we had it with those incredible crispy bits right from the oven. Let’s just say the main course lived up to its billing. It was my job to come up with a dessert to follow that. I stuck with the Momofuku theme and turned to Christina Tosi’s Momofuku Milk Bar cookbook. I’ve made plenty of cakes lately and I was ready for a change. It wasn’t quite the weather for ice cream, and I wanted something portable and sharable, which meant individual custards or panna cotta type desserts were out. And somehow cookies just didn’t feel special enough. Which left me with pies and tarts, which seemed like just the kind of dessert that I like at the end a family-style dinner party. I figured I would need two pies or tarts to feed the crowd. And because I apparently can’t just take the easy route and make two of the same thing, I decided I needed two different varieties. I easily settled on Momofuku Milk Bar’s famous salty sweet crack pie for one of them, but I was a little stumped for the second one. Nothing seemed quite right. But I kept coming back to this beautiful plated dessert that Tosi had served at Ssam Bar. It had a molded Thai tea parfait on a schmear of lemon mascarpone, all sprinkled with an almond thai tea crunch topping. The flavors sounded just right (and I love these Thai iced tea popsicles), but I wasn’t going to mess with a plated dessert and I didn’t have the right molds anyway. One of the things that I love about the Momofuku Milk Bar book is that it has given me a window into Tosi’s brain to see how a real pastry chef thinks. 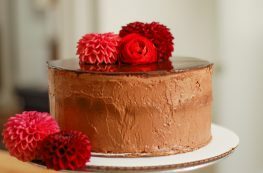 She works with what she calls mother recipes, which are components that serve as building blocks for her desserts. I realized I had the components I needed, I just needed to put them together in a different way. The crunchy topping could become a tart crust. The molded parfaits could be rejiggered into a filling and the lemon mascarpone could move from being a schmear on a plate to dollops on top. With a little bit of adapting and scaling, I was pretty confident it would work. It’s projects like this, where I get to exercise some creative muscles, that make cooking and baking so satisfying for me. This made for a light and refreshing dessert. It also inspired some lively conversation (on how it was covered with enough nips to suckle a litter) and even some impromptu musical accompaniment. 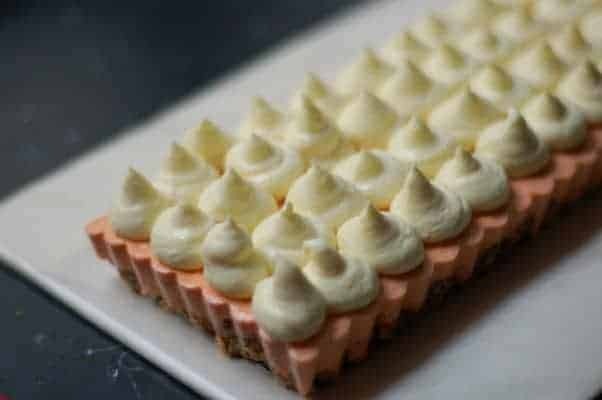 The filling of this tart tastes like Thai iced tea sweetened with condensed milk. The crust here is unconventional. 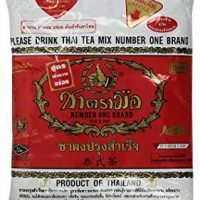 It’s salty and crispy from cornflakes and rich from almonds with some more Thai tea flavor and a hit of sour from the citric acid. 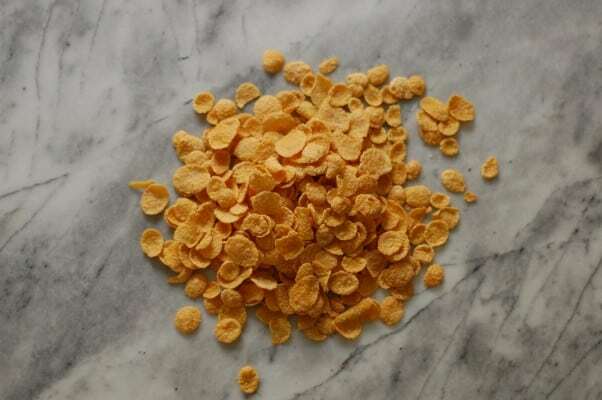 This crust is gluten free if you make it with a gluten free corn cereal (the classic cornflakes are sweetened with malt syrup, which contains gluten, but there are many gluten free variations in the cereal aisle these days). 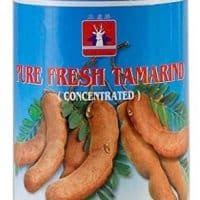 You should be able to find the Thai tea and tamarind concentrate in most Asian grocery stores (I found them at Golden Pacific in Andersonville) and I’m sure you can find them online if you don’t have a local source. 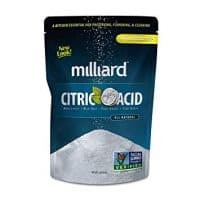 I found citric acid at the Middle Eastern Bakery (also in Andersonville) and the prepared dulce de leche at Edgewater Produce. It’s worth exploring ethnic grocery stores in your area for these ingredients, but I’m sure you can order everything online. None of it should be too hard to find. This needs to freeze for at least 3 hours and then thaw for at least three hours before serving, so plan ahead. I found it easiest to make everything except the lemon mascarpone the day before, let it freeze overnight, thaw in the fridge during the day, and then pipe on the lemon mascarpone within a few hours of serving for best appearance. You’ll need a tart pan with a removable bottom for this to come out cleanly. I used a 14×4.5-inch rectangular tart pan like this but it would also work in a standard 9-inch round tart pan like this. 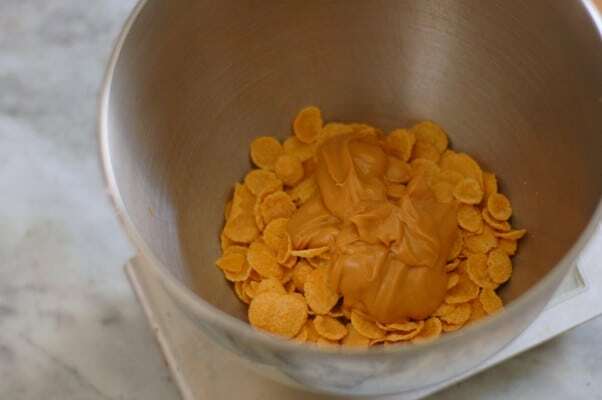 Combine the slivered almonds, almond butter, cornflake cereal, confectioners’ sugar, salt, Thai tea leaves, and citric acid in the bowl of a stand mixer fitted with the paddle attachment. 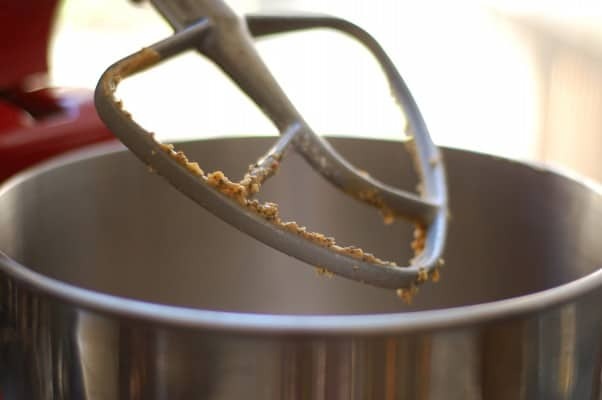 Mix on low speed for about 2 minutes, or until the dry ingredients are thoroughly moistened and the mixture looks well combined. Dump into the tart pan, and press into an even layer along the bottom of the pan. Don’t worry about pressing it up the sides for this one, the filling is stable enough it doesn’t need sides to hold together. 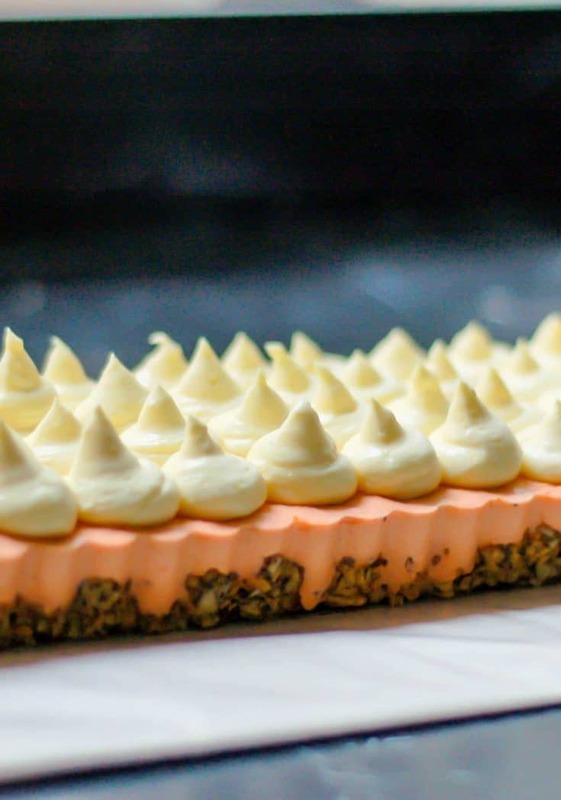 Using a pastry brush, spread a thin coating of melted white chocolate over the crust (this will protect the crust from getting soggy from the filling). Freeze for 10 minutes to set the chocolate. 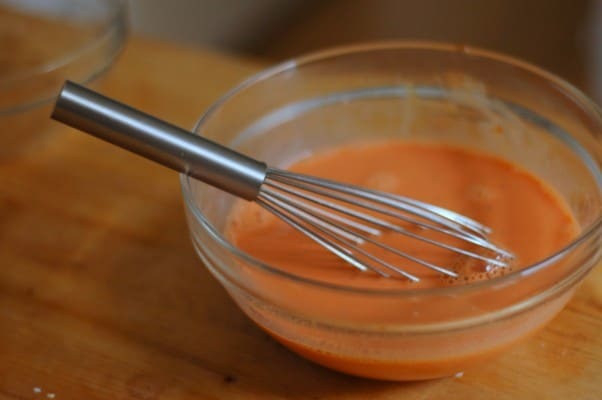 Make the Thai tea parfait filling. 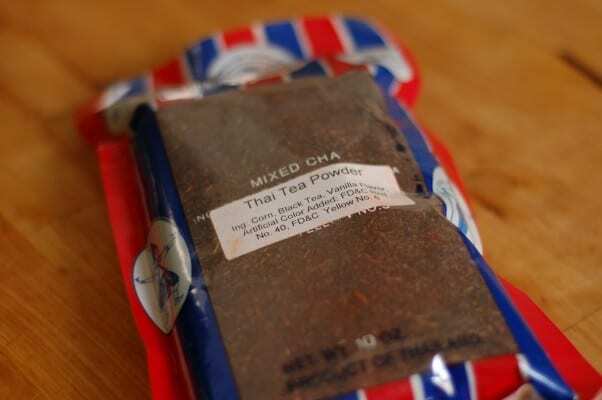 Place the water and Thai tea leaves in a blender and blend four about 30 seconds. Let steep for a half hour and then strain through a coffee filter into a small saucepan to remove the fine tea bits. 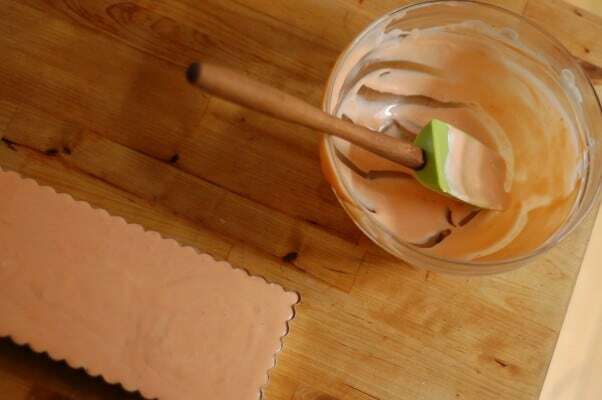 Bloom the gelatin (David Lebovitz has a great primer on how to do that). Heat the strained tea water until it is warm to the touch, add the gelatin, and stir until it’s dissolved. 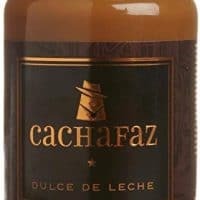 Pour into a mixing bowl, add the condensed milk, dulce de leche, tamarind concentrate, and salt and whisk until thoroughly combined. Put the bowl in the refrigerator for about 30-40 minutes, whisking every 5 minutes, until the base has started to thicken but isn’t fully set. You want to be able to fold in the whipped cream and sour cream mixture and have it hold its shape some. It should be thick but still pourable. Depending on your bowl and your refrigerator, this may take more or less time, so pay attention to the texture each time you whisk it. 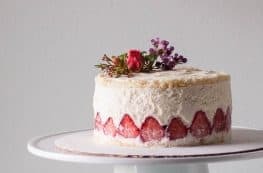 When the base is looking close to ready, whip the heavy cream and sour cream in a stand mixer fitted with the whisk attachment until the mixture holds medium-soft peaks. When the parfait base is ready, pour it into a large mixing bowl, and fold the whipped heavy cream and sour cream mixture into it with a rubber spatula until the mixture looks homogenous. Pour over the tart crust, smoothing the top with a spatula, and freeze for at least 3 hours or overnight. Thaw at room temperature for 3 hours or in the refrigerator for approximately 8 hours (or up to 24). While the tart is thawing, make the lemon mascarpone. Start by making lemon curd. Zest the lemons into a blender. Squeeze about 1/3 cup of juice from the lemons, removing any seeds, and add the juice to the blender along with the sugar. Blend until the sugar has dissolved. Add the eggs and blend on low until thoroughly combined. 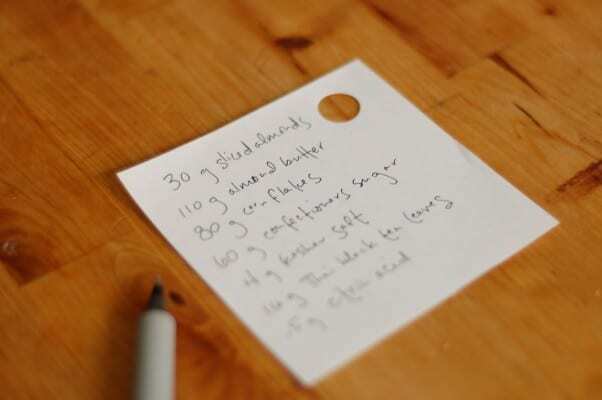 Transfer to a medium saucepan and clean the blender. Heat the lemon and egg mixture over low heat, whisking constantly, until the mixture thickens to a spreadable consistency or comes to a boil, whichever comes first. Immediately transfer back to the blender, add the gelatin, butter and salt, and blend until the mixture is thick, shiny, and smooth. Pour through a fine mesh strainer and refrigerate until thoroughly cooled, at least 1 hour. When the lemon curd is cold transfer it to the bowl of a stand mixer fitted with a paddle attachment, and mix on low speed for about 30 seconds to smooth it out and loosen it up a bit. Add the cold mascarpone and mix on low speed until just combined. Be careful not to overmix this because the mixture could break and become an unsightly mess. Err on the side of undermixing and finish it with a spatula if need be. Chill until ready to use. 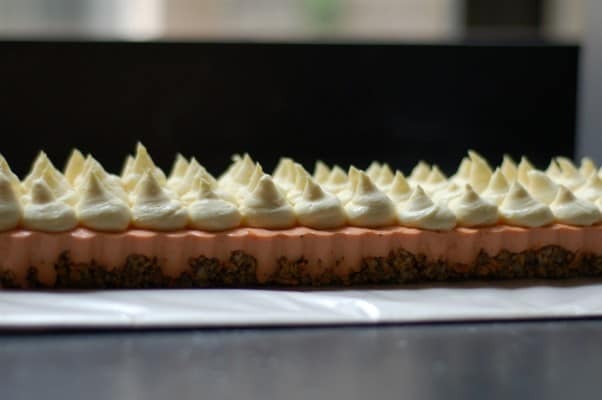 Within a few hours of serving (or right before serving), transfer the lemon mascarpone to a pastry bag fitted with a large plain tip or plastic zip top bag with a corner snipped, pipe dollops of lemon mascarpone over the top of the tart. 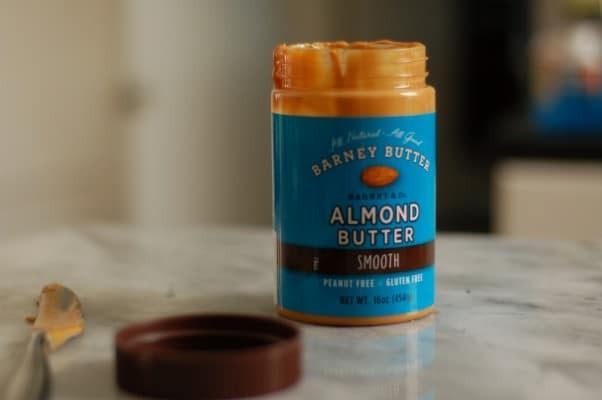 You may have a little extra (which is great on toast or pancakes or stirred into yogurt). Slice with a chef’s knife, and serve. Everything about this amazing Thai tea tart looks amazing! A showstopper of looks and flavour. Wow! You went ALL OUT on dessert! I want to come to one of your dinner parties! I just made the Momofuku pork buns (yes, I made the buns) and they were outstanding. 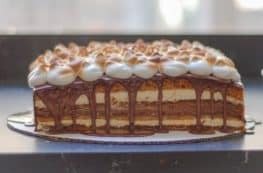 I’d love to make some of the desserts from Milk Bar — and I love the idea of that crack pie! Almonds and lemon go so well together and are the perfect spring ingredients. I would love a slice of this right about now. Such a pretty dessert. This is one delicious looking dessert! I like the crust and beautiful presentation! 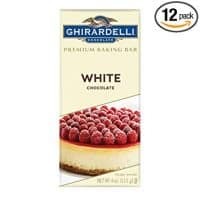 This is such a unique and glorious tart! 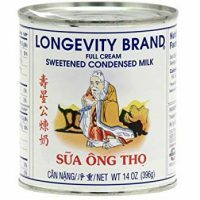 I love the use of thai tea in this – I can almost taste it in my mind! 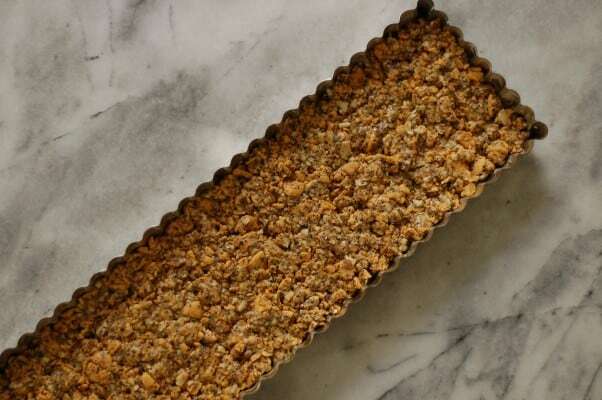 And the cornflake crust – genius!